Pierre-Auguste Renoir (1841–1919), Chrysanthemums (1881-82), oil on canvas, 54.7 × 65.9 cm, Art Institute of Chicago, Chicago, IL. Image by Rlbberlin, via Wikimedia Commons. Sometimes perfectly good pigments prove just too awkward for general use. Given the shortage of lightfast bright greens, it’s surprising how little-used Malachite Green is in European painting, despite its rich colour. For a while it rejoiced quietly under the traditional names of Chrysocolla, Green Verditer, and even Green Bice, but only ever became popular in Japan and China. As a natural mineral, Malachite is not uncommon, and a reliable source of pure pigment, which is chemically basic carbonate of copper. Although another copper green like Verdigris, it is quite different in properties and distinct in its use. Malachite Green was known to the ancient Egyptians, who appear to have used it as eye-paint. Found abundantly in Japanese and Chinese paintings from the seventh century onwards, it wasn’t used much in Europe until the Renaissance. After that, its use in Europe almost died out until the nineteenth century, when it enjoyed a brief return. Two versions of the painting by Watanabe Kazan 渡辺崋山 of Sato Issai 佐藤一斎（五十歳）像 show Malachite Green at its finest. 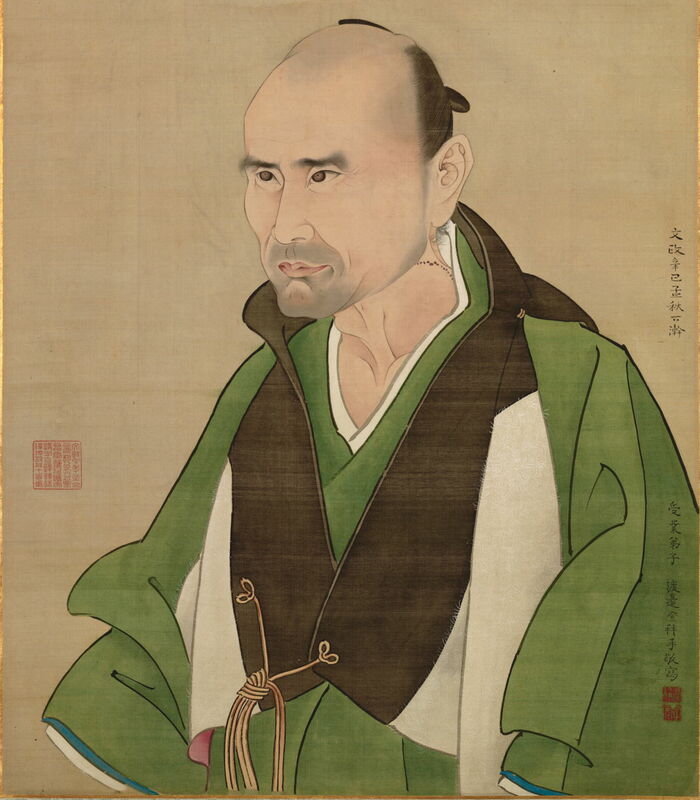 Watanabe Kazan 渡辺崋山 (1793-1841), Portrait of Sato Issai 佐藤一斎（五十歳）像 (1824), ink and colour on silk mounted on panel, 212.2 x 67 cm, Freer Gallery of Art (Purchase — Charles Lang Freer Endowment), Washington, DC. Courtesy of the Freer Gallery and the Smithsonian Institution. This version from 1824, now in the Freer in Washington, is known to use Malachite Green, a slightly blue shade and deep in colour. 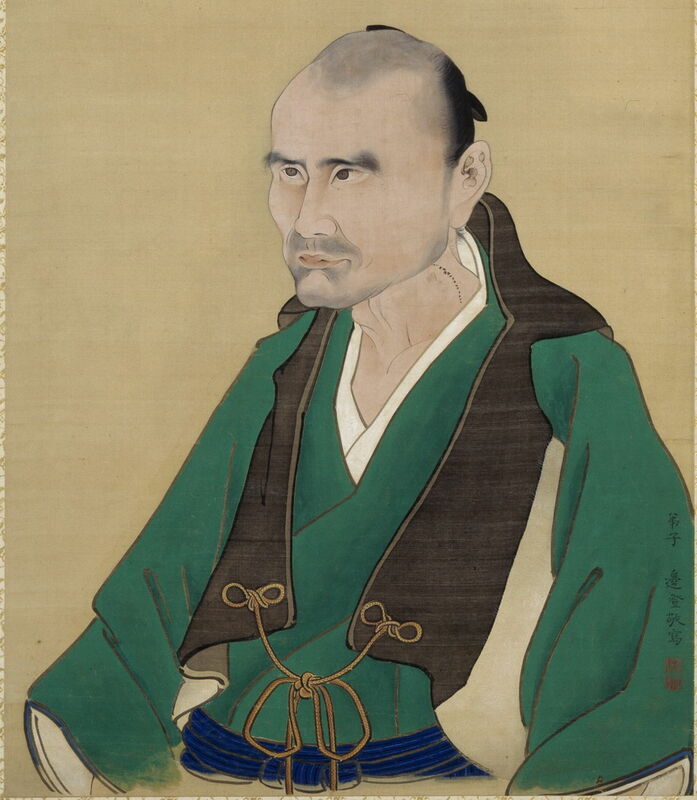 Watanabe Kazan 渡辺崋山 (1793-1841), Portrait of Sato Issai (age 50) 佐藤一斎（五十歳）像 (1821), colour on silk 絹本着色, 80.6 x 50.2 cm, Tokyo National Museum 東京国立博物館, Tokyo, Japan. Wikimedia Commons. This smaller and earlier version from 1821, now in Tokyo, is a lighter, more yellow shade. I’m not aware of its pigment having been analysed, but I’d be surprised if it was straight Malachite Green. The biggest problem with Malachite Green in Europe was the popularity there of oil paint. The pigment worked well where it could be ground quite coarsely, and used in aqueous media like fresco and egg tempera. But the finer that you grind it, the paler it becomes; oil painters like smooth buttery paints with fine particles of pigment, something which sadly didn’t work for Malachite Green. The rich, almost emerald green robes of Spinello Aretino’s Virgin Enthroned with Angels from about 1380 contain Malachite Green, here in tempera medium. Hubert van Eyck (c 1366–1426) and Jan van Eyck (c 1390–1441), Adoration of the Lamb, panel from the Ghent Altarpiece (c 1425-1432), oil on panel, 137.7 x 242.3 cm (panel), Saint Bavo Cathedral Sint-Baafskathedraal, Ghent, Belgium. Wikimedia Commons. 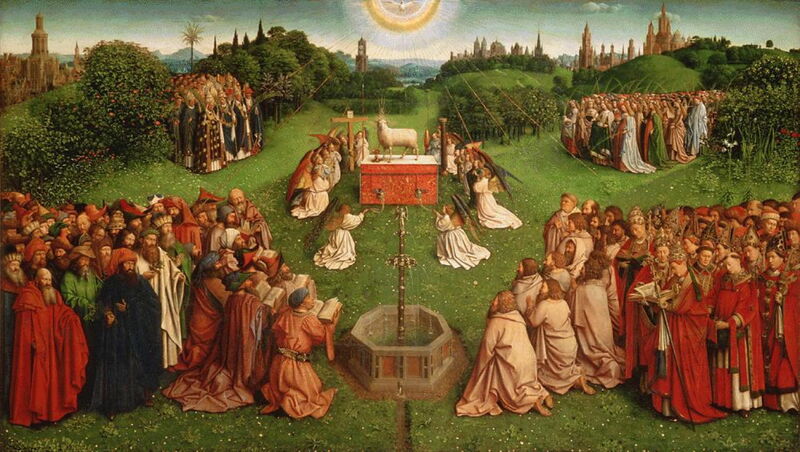 Among its earliest appearances in oil paint is the spectacular centre panel of the van Eyck brothers’ Ghent Altarpiece, famed in its own right as the Adoration of the Lamb (c 1425-1432). 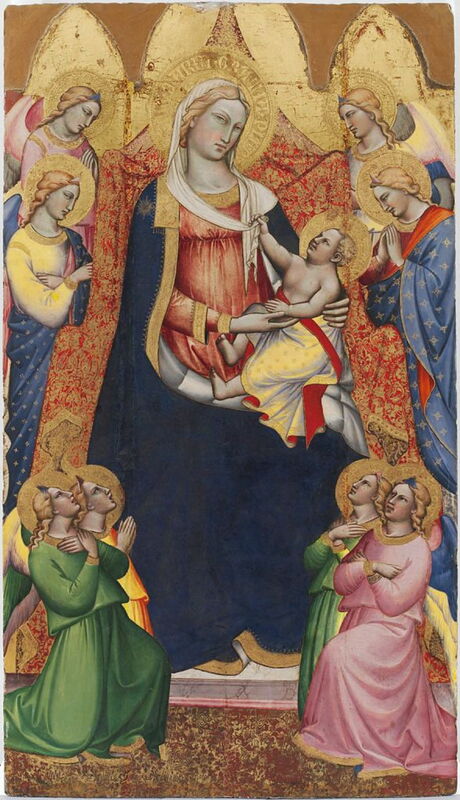 Continuing use of egg tempera in the Southern Renaissance helped its survival. 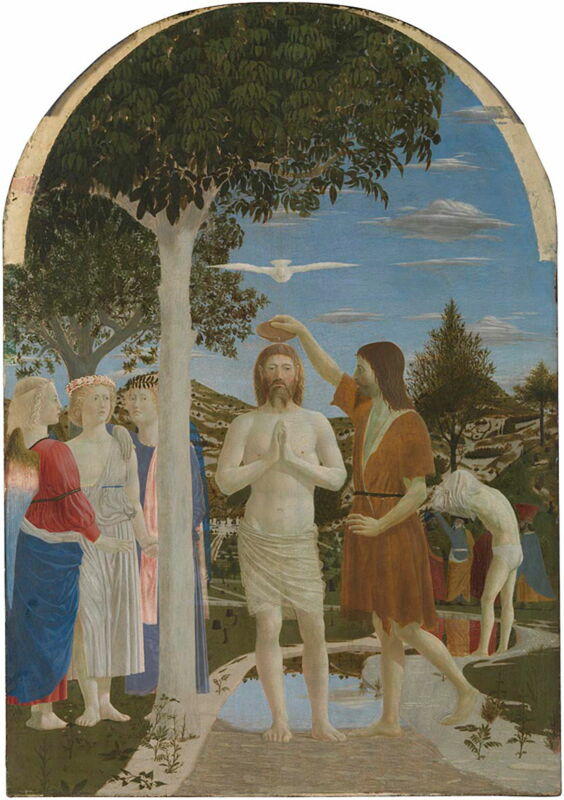 Piero della Francesca’s famous The Baptism of Christ (after 1437), made in egg tempera on poplar wood, relies on the pigment for its greens. Microscopic examination of the paint layer here shows coarse mineral particles typical of natural Malachite. Francesco del Cossa (c 1435/6-1477/8), Saint Vincent Ferrer (c 1473-75), egg on poplar, 153.7 x 59.7 cm, The National Gallery (Bought, 1858), London. Courtesy of and © The National Gallery, London. In Francesco del Cossa’s Saint Vincent Ferrer from about 1473-75, Malachite Green has been identified in the dark green grass at the foot of the painting. This too was made using egg tempera. However, microscopy of the paint layer shows that these pigment particles don’t seem fractured as if they have been ground, but are globular, as occurs when the Malachite Green has been made by a process of precipitation. Such artificial Malachite Green didn’t appear in European paintings until after about 1430. 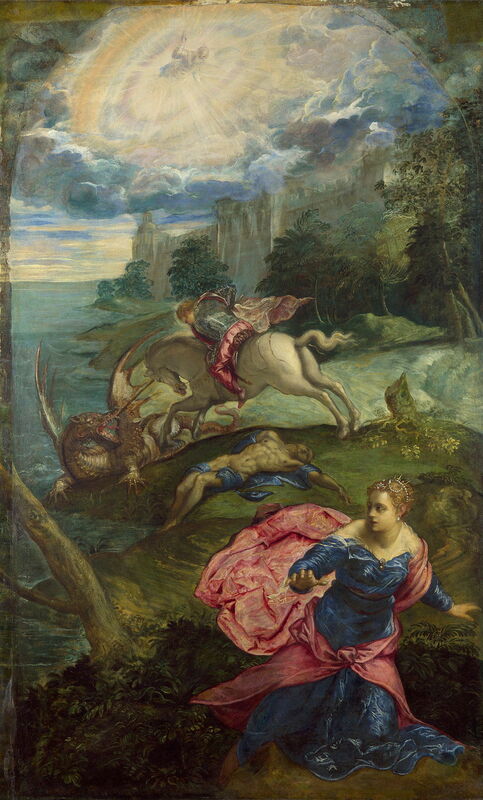 Although he painted in oils, Tintoretto was an enthusiastic user of Malachite Green. To obtain the range of greens seen in the rich and varied colours of vegetation in his Saint George and the Dragon from about 1555, he used this pigment with Copper Resinate glazes, a technique found in other paintings of the period. Tintoretto (1519–1594), The Last Judgment (1560-62), oil on canvas, 1450 x 590 cm, Chiesa della Madonna dell’Orto, Venice, Italy. Wikimedia Commons. 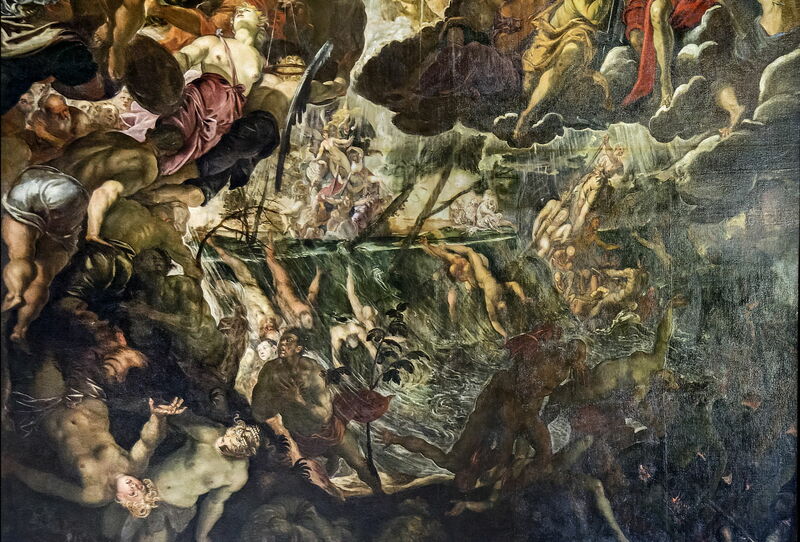 Tintoretto’s vast oil painting of The Last Judgment (1560-62) in the Chiesa della Madonna dell’Orto, Venice, has been found to contain Malachite Green, I suspect in the band of green depicting the Flood just below the centre. The detail below makes this a bit clearer, I hope. Tintoretto (1519–1594), The Last Judgment (detail) (1560-62), oil on canvas, 1450 x 590 cm, Chiesa della Madonna dell’Orto, Venice, Italy. Wikimedia Commons. Domenichino (1581-1641) and assistants, Apollo pursuing Daphne (1616-18), fresco formerly in Villa Aldobrandini transferred to canvas and mounted on board, 311.8 x 189.2 cm, The National Gallery (Bought, 1958), London. Courtesy of and © The National Gallery, London. 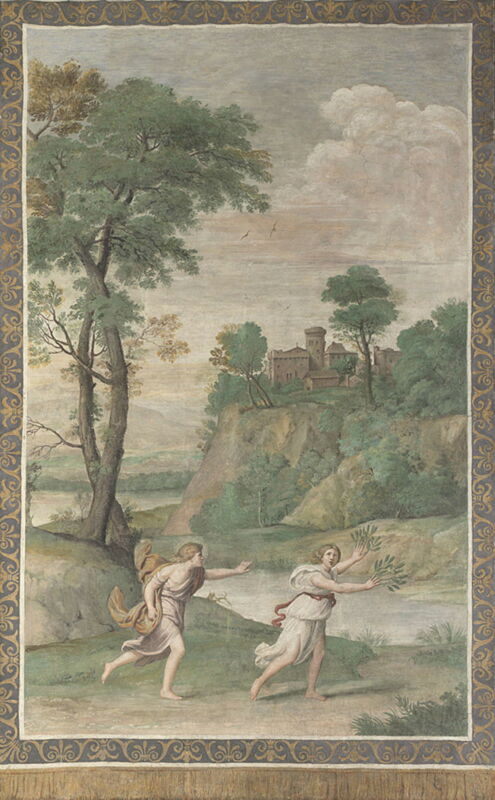 When painting the frescoes formerly in the Villa Aldobrandini between 1616-18, Domenichino and his assistants relied heavily on Malachite Green. It has been formally identified in this section, showing Apollo pursuing Daphne, where it is the mainstay colour remaining, and is suspected in most of the others. Although only classed as moderately permanent, these and other examples of very old frescoes generally show how well Malachite Green has retained its colour after four centuries or more. With the rise of oil painting, this pigment then fell from favour across Europe. 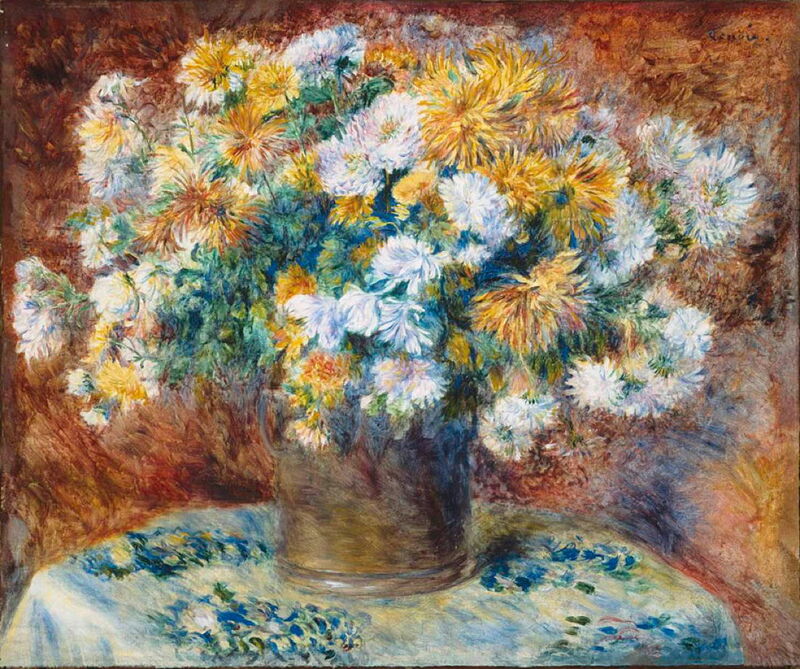 One of those who participated in its revival in the nineteenth century was Pierre-Auguste Renoir, whose painting of Chrysanthemums from 1881-82 shows how it could still be used in oil paint. But by then there was a much wider choice of more modern green pigments; the revival was short-lived, and Malachite Green has hardly been used since. Rutherford J Gettens and Elisabeth West Fitzhugh (1993) Artists’ Pigments, vol 2, edited by Ashok Roy, Archetype. ISBN 978 1 904982 75 3. Posted in General, Life, Painting, Technology and tagged artists paints, del Cossa, della Francesca, Domenichino, history of painting, Kazan, painting, Piero, pigments, Renoir, Tintoretto, van Eyck. Bookmark the permalink.